With a business that comes with such high initial capital requirements, such as an aircraft charter business, it is crucial to start recouping the funds you invested as soon as possible. However, with the high and frequently changing operating costs of an aviation business, it’s often difficult to strike the right balance between your expenditures and your rates. Here are a few ways to help you maintain a good profit margin while still offering an exceptional flying experience to your clients. 1. Consider renting out extra space in your hangar or land. If you own a hangar or land and have excess space even with all of your planes stored, one option you have for making additional money is by renting it out to other aircraft owners for hangaring or tie-down. Depending on the size of the aircraft as well as your location, this can easily earn you around $200 per plane for hangar space, and around $120-150 for tie-down space. 2. Try to form partnerships with your suppliers. Find luxury suppliers that are in line with your brand, and that produce quality goods, and see if you can build a partnership with them. This can be in the form of discounts for exclusive dealing, or a joint promotion arrangement. 3. Check the market prices and compare with your own. 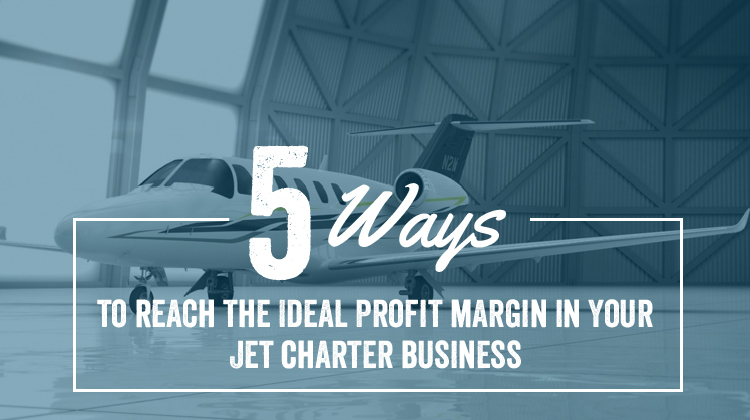 Since private jet flights are a luxury service, a lowest-in-the-market approach to pricing isn’t really vital; you don’t have to price significantly lower than your competitors. Frequently check the market rates and see if you might be pricing too low (or, alternatively, pricing too high thereby hurting your sales). Tiered pricing (offering packages with different prices, with varying premiums) is a good way to introduce value-added services and higher rates to your client base. You might discover different luxuries or bonuses that your clients are willing to pay for, without costing your business too much to invest in. 5. Work with business consultants. If you aren’t confident in your ability to crunch the numbers, or in your knowledge of the jet charter industry thus far – or if, try as you might, you just can’t figure out why your profit margins are slimmer than you expected – it might be a good time to work with a business consultant. Find someone with good knowledge of aviation businesses (airlines or private), and see what insights they have about how you’re running things. They will have useful suggestions about the sort of adjustments you need to make in order to be more profitable or raise the red flags on things that might be costing you money needlessly. The aspects involved could include how you market your service, how you source your supplies, or even how you manage your employees. Note that you don’t always have to follow all of their recommendations, but the insights they offer could prove invaluable.